Today marks the beginning of Lent. And to acknowledge it, we thought we would share a sacred place that we visited in Turkey. We’re also sharing a story that we haven’t told anyone as yet. 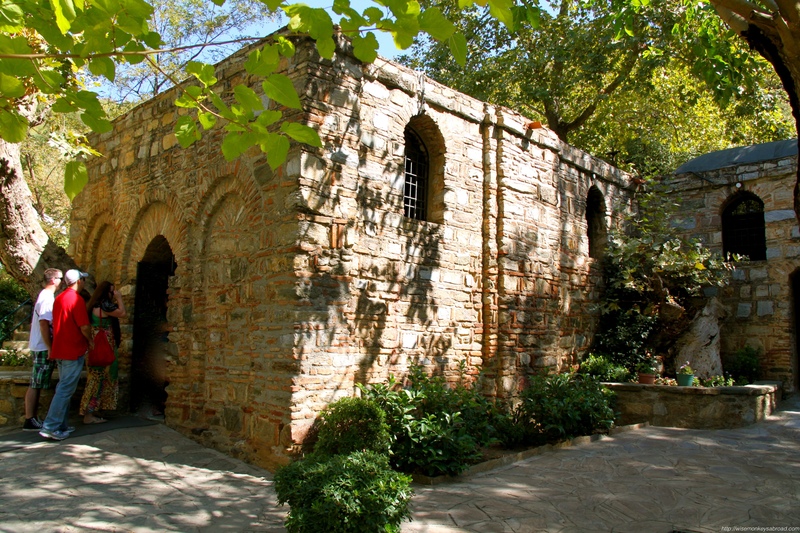 The last home of the Virgin Mary, Mother of Jesus, although it has not been officially pronounced as so by the Vatican. There is an information board before heading down the path abut the archeological evidence. The stone house is now a chapel. It is located in very peaceful surroundings. We walked along a footpath, lined with lush green trees before lining up outside the doors of the chapel to enter. Despite the number of visitors there, it was respectfully quiet. We stepped foot inside and we were welcomed with complete silence. Everyone was walking down the middle towards the altar, in pairs or in single file. There were people kneeling to the sides, people with their heads bowed, people kissing the tips of their fingers, people doing the sign of the cross. There’s a deep sense of serenity in the modest-sized chapel. Respectfully, we wanted to make a donation and true to our clumsy selves, we broke the silence embarrassingly. Amongst the peace and quiet, the coins decided to fly out of our wallets, clanking and rolling around the chapel. Our initial reactions were to hang our heads, let out a sigh and mutter “Oh no!”, wishing for that split second the ground below would swallow us up. Quickly and as quietly as possible, we gathered the coins and placed them in the donation box before we made a beeline for the exit. We didn’t even want to stay a second longer and disrupt any more of everyone’s tranquil moment in Mary’s House. 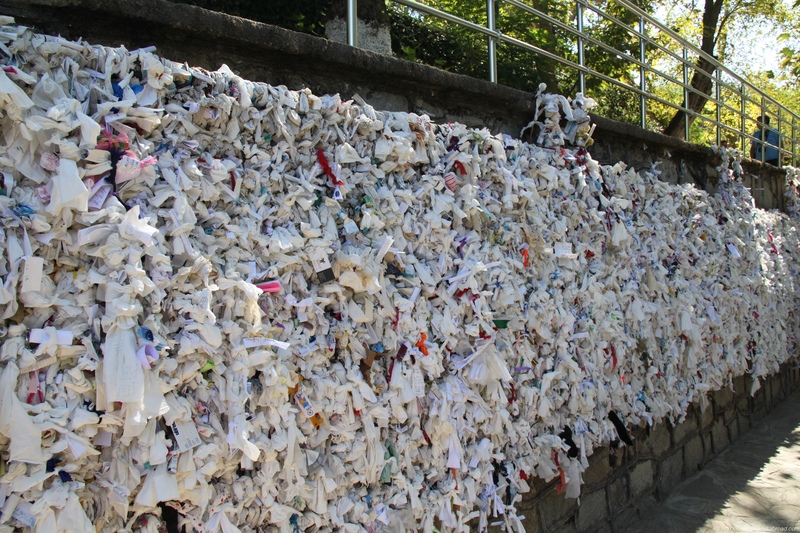 Once outside, there is a “wishing wall” where pilgrims can tie their wishes onto. We didn’t actually tie up any intentions because our only wish right then, was to wish we could forget the commotion we created inside. Mary’s House was a significant spiritual place for us to visit, an experience we would never forget for more reasons than one. Can you make us feel better by telling us about a time you created a scene unintentionally while travelling? 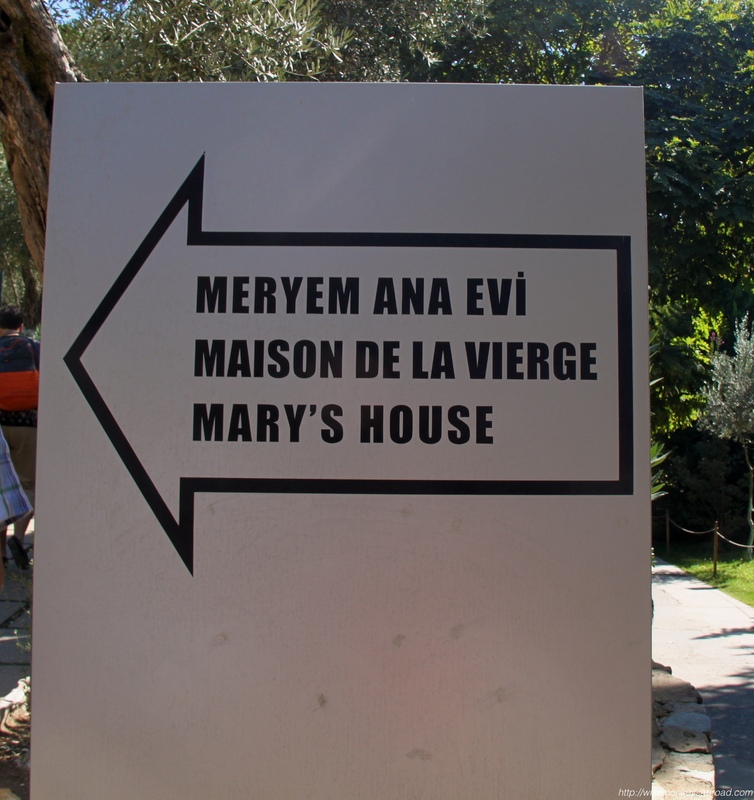 This entry was posted in Turkey, Turkey and tagged Lent, silence, Travel, Turkey, Virgin Mary House. Hahahah – yeh – mistaking a stick for a bird is pretty good 🙂 We are definitely feeling better with all these stories 🙂 Hope you had a wonderful weekend. I think we have all had those moments and they are most likely more embarrassing for us than annoying or disrespectful to others. Very well said! That certainly does make us feel better… it is our own perception more than anything! 😉 Well, the more stories we hear, the better we are feeling! Thanks for sharing. You know….it seems this kind of stuff happens when we are trying to be the most respectful. I will tell you that I set off the alarms in Santa Maria del Popolo in Rome. Yes…..yes I did. I was there with my sis and our kids (5 kids all together). One of them dropped their toy from their happy meal in the area of the Caravaggio we were looking at. Now a normal person would leave the meaningless happy meal toy there. But not me, I climbed under the rope (short skirt and all) and set off the alarms. Ha, ha, ha…yes….alarms in that church, probably flashing everyone as well. But…..seeing as how we were in Italy, once I explained to the guards we were trying to retrieve a toy for a CHILD…all was forgiven. Because the Italians will do ANYTHING to make a child happy in Italy. That was ONE of my moments. Anyway….this post was lovely….this place looks so special. Oh Diana! Hahahahah – this was hilarious! Thanks so much for sharing your story. Not only alarms of the building but probably shocking all these people with your mini skirt manoeuvre 😉 Well done! We should’ve had a giveaway for the best story with this post. So many good stories coming through. I got into trouble in Bruges for trying to take a photo of the Relic of the Holy Blood in the Basilica of the Holy Blood. Actually I wasn’t taking a photo of the relic, just the woman guarding it, but she waggled her finger at me in a very cranky way! And then when I told Mr ET, I got into trouble for talking from another man. Oops. Hahaha – totally! Those are our exact words in fact…. Lucky, no crowds!! We felt we were being shuffled along by the people coming in behind us and we would’ve liked to have stayed in there for a bit longer – but with the “scene” we created… we just wanted to sheepishly disappear! Kind of creepy that they found theis place after the visions described by that nun. I am always sceptical when it comes to these things but then again, why shouldnt it be true? With time, our skepticism has just escaped us. We have no reason not to believe it, right? May the Year of the Goat for you and your “crazy” family 😉 be a prosperous, happy and healthy one! 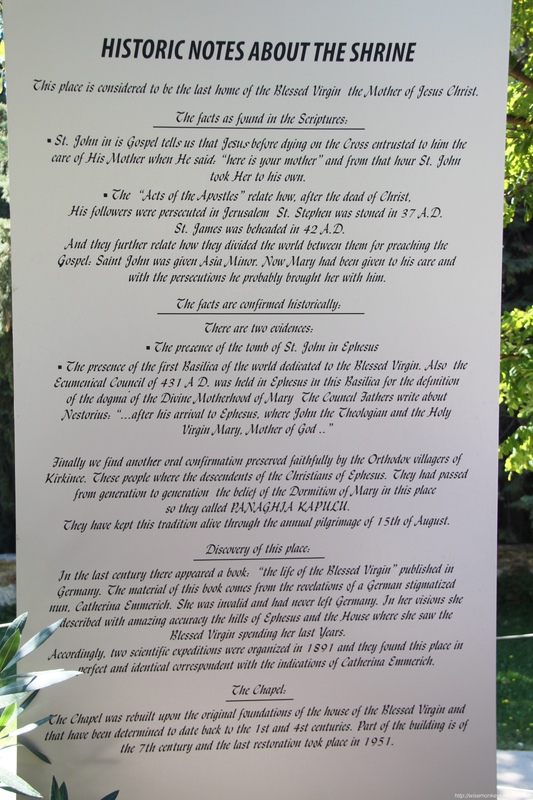 I was not quite sure, whether this is the place near Ephesus unless I read the notice on the photo. It would be nicer, when the location would have been mentions in the text. Might have to put your post through Google translate to read about what happened to you! Thanks for reading! Not quite! I had just about made it to Jane Austen’s grave in Winchester Cathedral, when I was asked to leave by a church official. I tried to explain that I had come all the way from Sydney to pay my respects to Ms Austen. His response was “Sir, this is a place of worship, and it is about to be used as such!!”. I left. Hehehe – K! We knew we could count on a fellow Sydney-sider to make us feel less sheepish 😉 Thanks for sharing your experience! I wonder why you weren’t allowed to go to Jane Austen’s grave in the cathedral in Winchester. It’s not like it’s private. That’s just weird. That official must have been having a very bad day.